Neil McCafferty believes Coleraine’s strength in depth is one of the main reasons behind their impressive start to the season. James McLaughlin came off the bench to secured a deserved share of the spoils for the Bannsdiers against Linfield on Saturday. As we know it’s not the first time a super sub has come on to do the business for the Showgrounds outfit this season. “In my first couple of years here we maybe didn’t have a big enough squad, but now the young players have a couple of years experience under their belts and the gaffer has brought in some good additions,” he said after the game. “The squad has been built up and everyone is fighting for their place, which is a good thing. “We’re on a good run at the minute and have had a few good results in recent weeks, but we won’t get carried away just yet. “We got a decent point against Linfield today, but if we don’t carry that on against Dungannon on Friday night it will count for nothing. “We want to keep the run going and hang on to Linfield and Crusaders as much as we can and stay in the pack. “Results breed confidence, we’re doing well and winning games, scoring goals and defending well too. 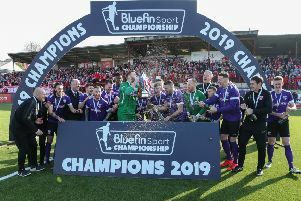 His boss, Oran Kearney, also highlighted the benefit of having players on the bench who can come on and influence the game. “It’s really important to have options on the bench, particularly forward players,” he said. “It keeps them all on their toes too as they know if their not doing it another players will be determined to come in and take their chance. For Linfield it was another disappointing afternoon. They faded after a bright start, which saw them take the lead in the opening quarter thanks to Andy Waterworth’s header. “We came here today against an in-form Coleraine side and we took the game to them,” said Linfield skipper Jamie Mulgrew. “The manager wanted a reaction after the midweek defeat, and I think he would agree he got that in the first half. “But it changed after the break, for what reason I don’t know. Overall it’s very disappointing, even though we have got a point. “It’s really disappointing after how well we played in the first half.